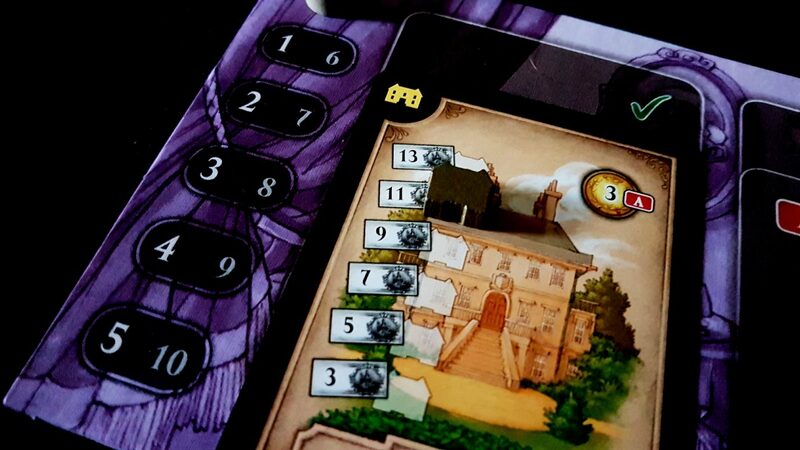 A review copy of Last Will was provided by Czech Games Edition in exchange for a fair and honest review. 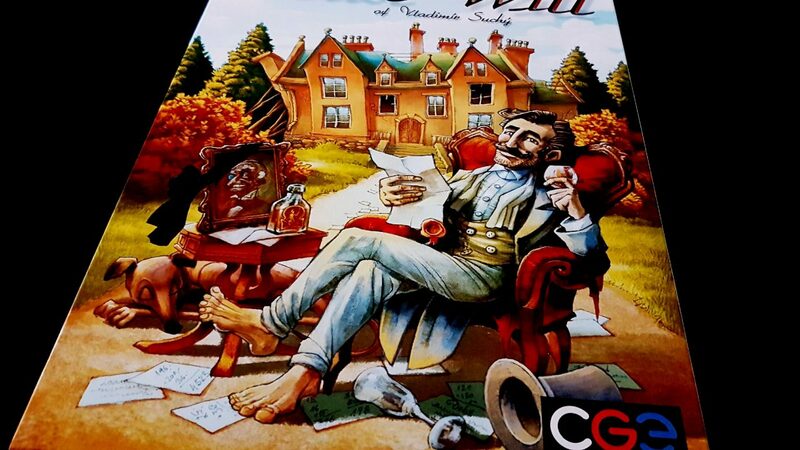 Last Will, or Brewster’s Millions: The Board Game, is a fun and funny game of taking vast wealth and setting it ablaze in a massively entitled Edwardian garbage fire. We gave it three and a half stars in our review, and it promptly went out and tried to lose them all in a stupidly unprofitable property deal. Sorry Last Will, it doesn’t work like that here. We brand your stars into your forehead as a warning to others. I know that hurt but you shouldn’t think that’s the worst of it over with – do you see all these other red hot irons? We’re going to apply these liberally and freely as we explore every nook and cranny of your accessibility. 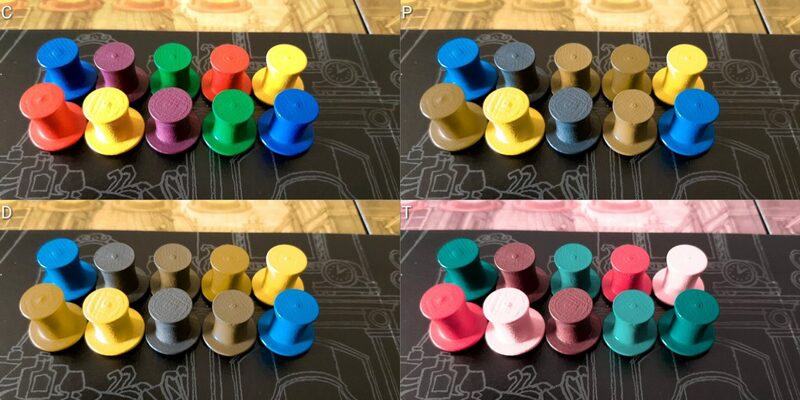 There’s a colour problem when dealing with errand boys and action tokens, but it’s not quite as significant as it might first appear since this is only occasionally information that is relevant to you as a player. For example, errand boys are used to claim action spaces during a turn but you only rarely care who claimed an action space. The main thing you need to know is that it’s not available any more. You might in some particularly competitive circumstances really need to know who is working towards which goals, but in most situations you only need to know if the space is free. Similarly for action tokens – you need to know where you are going to be acting in turn order, but you’re rarely going to be making that decision in explicit response to what another player is doing. There are occasional scenarios where you see someone going for a lot of actions so you need to respond in kind, but you’ll also see them placing down the token and can make your decisions in that context regardless of colour cues. Otherwise, colours are not a major problem although in poor lighting the various different kinds of properties can be difficult to make out even for those with fully chromatic vision. A different icon is used for deprecating properties versus farms, and it would have been nice to see all three kinds of residential properties having their own unique icons to help ease this issue. We’ll recommend Last Will here – it could be better, but the problems don’t seriously impact on play in most circumstances. As usual, this is a game that is almost completely inaccessible for the totally blind. For those with less severe visual accessibility issues, it’s a more nuanced story. There’s a relatively small set of moving parts here you need to track, and actions other players take will help prune the possibility space in any round. You’re choosing between a number of action spaces (determined by player numbers) and between a number of cards for purchase. There are only a half dozen possible action spaces available, and their effects are all relatively clearly indicated on the board. The icon showing the number of cards to be drawn is a little on the small side since the number itself is embedded within a card graphic but it’s still likely to be readable and could be noted down in a more convenient format if necessary. Cards are relatively information dense, consisting of icon information in the corner and activation costs (and sometimes additional placement costs) along the top. Many cards come with complex symbology and these aren’t always particularly easy to differentiate or particularly parseable as a symbolic language. They are reminders rather than descriptive. Some other cards contain specific data that needs to be tracked, such as depreciating costs, and others will have small token assets distributed onto them as a result of other parts of card play. Some of this will only come into effect when the card is on the player board, but it’s going to be relevant when it comes to choosing opportunities for your errand boys to claim. Mostly though you’ll be selecting your cards from your hand, and while that has a lot of churn it also has a degree of optionality in how that works. Some cards let you increase the number you draw, some let you hold a larger number between turns. The number you draw in any case is going to be defined by your action space. This isn’t ideal as an accessibility compensation because it shouldn’t be the case ease of play comes at the sacrifice of game flexibility. However, it’s an option players have if they want to ensure a greater degree of reliability in their hand. That would help eliminate some of the memory burden on a visually impaired player that goes with tracking which cards are available to play. Your action board at least is quite tightly constrained in terms of its options, and it offers a degree of tactile state tracking with the use of an activation system that stresses card positioning. You move it up to indicate it’s been ‘tapped’ and reset it back down to indicate it hasn’t. This gives an ‘at a touch’ way of telling what state a card is in, although since this gets reset during the course of a round it doesn’t hugely alleviate issues of state tracking. It’s a nice idea, don’t get me wrong – it’s just that the memory burden needed to track state in this area anyway isn’t especially high. Other inaccessibilities come in here because the exact same shape and size of token is used to indicate companions installed on assets. The composition of these on a card is important. You might need to place a horse before a dog or a chef before a guest, and the number and ordering of these determines the cost of activation as well as what may be possible to play following on from the existing state. The colours too aren’t especially distinctive but really you could play this only using them as abstractions with physical position conveying all the necessary key information. It would be a little bit more burdensome, but not impossible. The depreciation icons are a different form factor, which is great, but they also need to be very tightly aligned to the value to which they attach. They change on a turn by turn basis (assuming the property hasn’t been activated) and it’s very easy for this to become misaligned if the location has to be assessed by touch or even by close investigation. 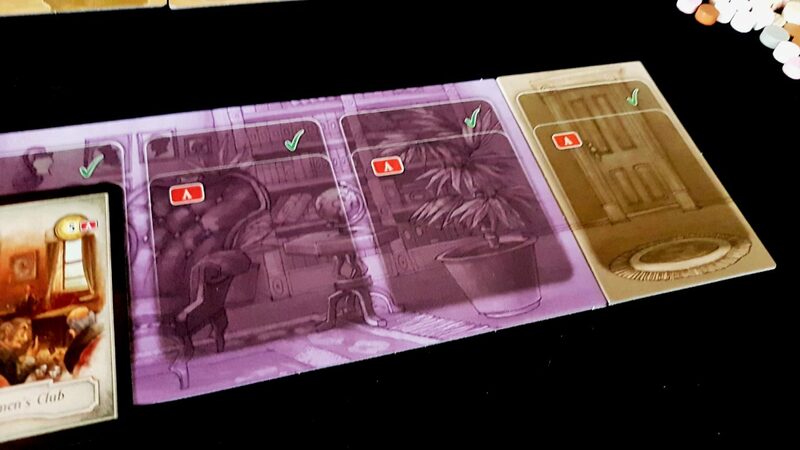 Nudging the card in the wrong way can easily put everything out of alignment. Money too is all of the same form factor and has no way of being differentiated by touch. Colour is used reasonably well to indicate denominations, but that is of course not a fully intersectional approach. It’s better than simply having a number change on a coin, but not much better – different form factors for each kind of note would have been better here. There’s nothing to stop you using some other kind of currency though such as physical coins – the face values involved here are not especially high. 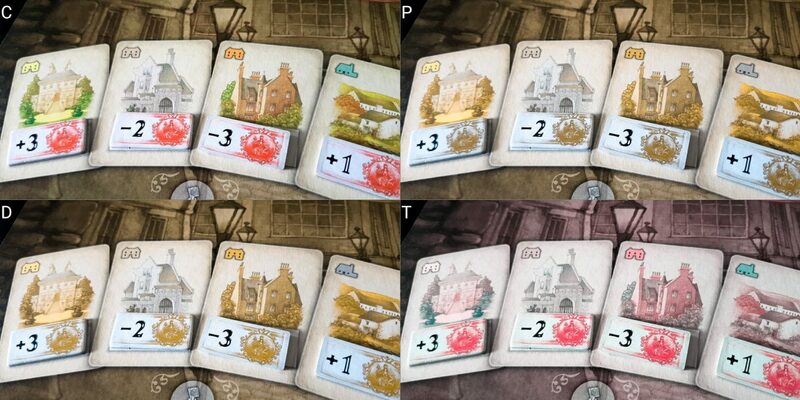 Last Will is probably playable for people with mild to moderate visual impairments, but it’s going to need a fair bit of compensation and house-ruling of alternative approaches to game management. We’ll tentatively recommend it here. There are some very nice features that support cognitive accessibility in Last Will. The activation tracking as noted above is excellent in this capacity. While remembering the state of activation is not necessarily very difficult for players without cognitive impairment this support is hugely valuable for others. Similarly, the game board itself adopts reminders as to how the drawn opportunities evolve over the course of the game – you look at what round you’re on and it tells you the specific kind of card that needs to be dealt out to the space. That’s both a nice gameplay system for keeping the game properly paced and a considerable aide memoire for players. Reading level required is low, but the need for symbolic literacy is quite high. There’s no easy lookup either for checking out what symbol combinations mean – you need to look through the reference at the back until you find it or a near approximate. That’s not great, but it’s numeracy that represents the largest expectation for players. During Last Will you’re doing constant arithmetic and it’s often dependent on the resources you have in play and conditional on market conditions. ‘Buy high and sell low’ is an easy heuristic that makes this task comprehensible on a strategic level. That though is quite hard to action because it involves assessing a ‘jump off’ point that is part intuition and part tactical gambling with time. For example, you might manipulate the property market to buy a mansion at three million higher than the face value. That’s a good move but it also needs you to line up two activities often in competition with other players that may not be very happy the real estate market might change. You then need to keep that property long enough to warrant the sale and the investment of a precious action but not so long that the sale is going to leave you with money of which you can’t get rid. That needs you to understand just how much money, and how quickly, you can get rid of in a single turn. And then for optimal return you also need to take into account the loss of the action that will let you devalue the mansion to a farther three million before you sell it. And you might have to do all of that over several properties of several different classifications. The individual numerate components are not significantly complicated in themselves, but they chain together in subtle ways – leaving it a turn too long might well lose you the game because everything else (including the composition of your hand) may have changed in the interim. Similarly when working out how best to use the resources you have in hand – is it best to use two chefs for an event, or seed them onto your ongoing reservation? How often will you get to make use of that reservation versus the instant return of the event? Is it better to repeatedly activate a property that doesn’t swiftly deprecate, or are there better uses of your actions? Everyone is on an inexorable slide towards poverty but the speed of descent is hugely important to the overall chance of winning. As such, the level of numeracy required is quite high in terms of explicit, ongoing requirements as well as in terms of the implicit probability of risk based endeavours. Game state tends to become quite complex although there is an extent to which that is optional. A player might have access to a resource that permits residential properties to be activated without an action cost as well as another that increases activation cost by a set amount on subsets of those properties. There may be several of these, in varied combinations, with different costs associated depending on which companions have been made resident on properties. The number of actions you have available will vary from turn to turn, event to event, and activation to activation. 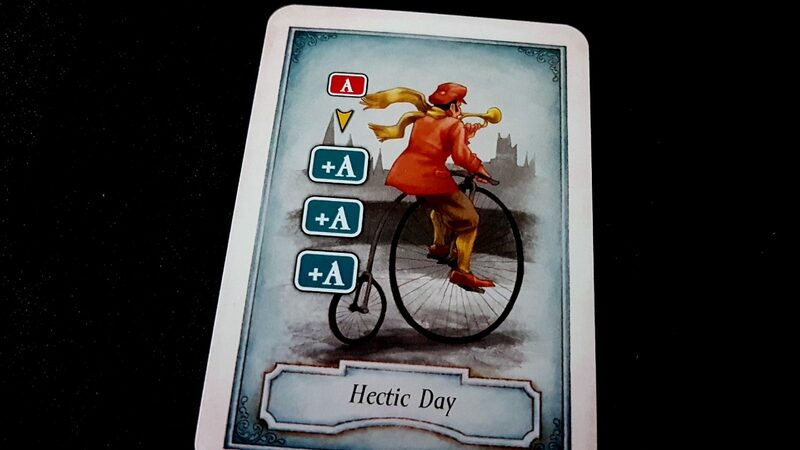 Some cards adopt a slightly perverse notation where you spend an action to get back three actions – this has little real gameplay impact but adds a minor cognitive cost that doesn’t need to be there. Simply ‘gain two actions’ seems like it would have been a much more straightforward way to handle it. Some resources cost an action or more to activate, others are free. Others still need no time but require money, or require money until companions are applied at which point they need money and actions. This is all moderated through a context of shifting cards, errand boys, and hand limits. Keeping track of this is made more manageable through the hard limit enforced by the player board, but the game also permits more extensions of the board to be purchased if you so desire. An extension where you can store ever greater amounts of rubbish. Scoring is mostly simple until you get to the end game because it’s the player that manages to run up the most debt in the end that wins. As such, you have money tokens to track progress until you reach zero and then you need to track debt either with money tokens you mentally reclassify as debt, or through some other notation method. Debt too is only possible to accumulate when property is not owned, but when there are no properties players can spend freely below the point of a zero bank balance. For those with fluid intelligence accessibility requirements we don’t recommend Last Will, but we can recommend it for those with memory impairments alone. There are tools in the game that let you screw with other players, but not many and they come at considerable cost to the person making use of them. You can for example arrange the real estate market to someone else’s intense disfavour but that costs you one of your actions and they can just wait until the next turn to undo it if they like. You can claim cards they will likely want, but you need to make sure you go for the earliest turn slot in order to guarantee it. Contention over scarce resources is the only real, reliable source of competition and even that is dulled by how easily cards can be obtained during play. The later a player goes in their turn, the less necessary everything else becomes because the latter action slots can be generous in their allocations. Score disparities rarely tend to be very high because it’s very difficult to make money in Last Will. The only way really is through the real estate market and even that’s unlikely for most properties since they depreciate every turn unless you prevent it. As such, everyone will trend towards zero – it’s only the speed of the descent that matters. In any case, ‘not losing as much money as someone else’ seems like a consolation prize of its own. 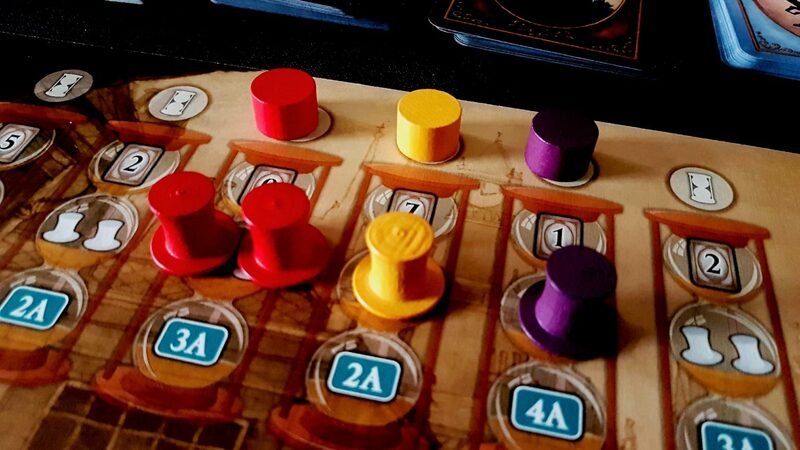 ‘I guess I’m just better with money than you’, is how Mrs Meeple puts it. It’s true, too. The only real issue here is that the nature of the action spaces, and of the opportunities you can purchase, means that some players can have a much better time on their turn than others. 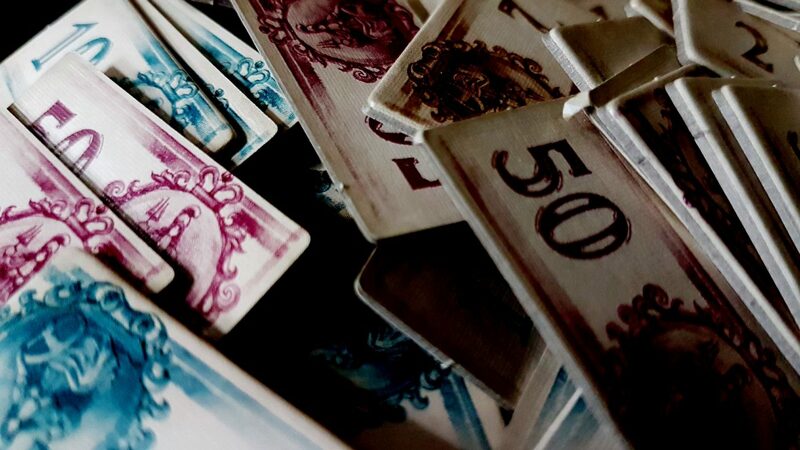 Purchasing an old friend and playing down a hectic day card can give someone six, seven or eight actions and that can lead to them absolutely dominating that and following turns. You don’t necessarily have access to the same chances as they do, although most of the cards that bestow extra actions are only available through errands. You play your own part in arranging your downfall there except in circumstances where the first player chooses to get up earliest. One final small note of caution here is that the entire premise of the game is profiting from the death of a relative. As such, there is a risk in some circumstances of the game exacerbating issues of morbidity or depression – especially if someone is inclined to read heavily into aesthetic elements of play. This is never really emphasised in the game though, and everything is so charmingly presented that it comes across as whimsical rather than anything else. It’s something to bear in mind though. We strongly recommend Last Will in this category. The good news here is that since there is relatively little moving game state it’s easy enough to replicate it provided you don’t mind perhaps mistakenly awarding or penalising a player a depreciation level or two. However, this is always likely to be the case with small components on glossy cards – they are low friction and easily upset. This is true too of the little tokens that are used to track companions installed on properties and the grey discs used to track spent actions. These are small enough to be an accessibility issue of their own. Hand limits in the game can be quite large during an individual round, especially if moderated by special powers. In a single round someone might be drawing as many as thirteen cards and discarding down to two at the end. That requires a particular setup of cards and action choice, and it’s rarely likely to come up – but it’s possible and may be of situational benefit for a player. As such, there’s a lot of churn of in-hand cards and a card holder, or two, is going to be hugely beneficial even it is simultaneously going to be awkward due to sheer volume of card movement. 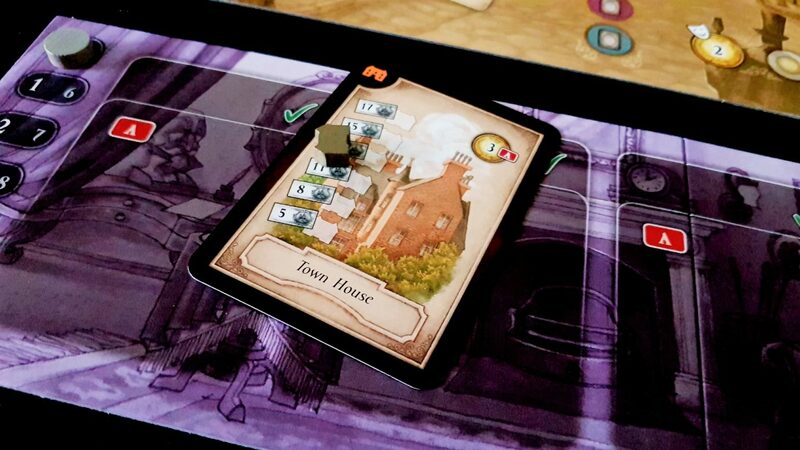 There’s occasional manipulation of other tokens, such as your errand boys and the real estate market, but for the first of those it doesn’t need to be in tight constraints and for the latter it is only something you’ll likely do once or twice in a game. Verbalisation is possible, but not especially supported. You can identify cards by number, but while it looks like you can select by description it’s not quite that straightforward since cards with the same name can have different effects and progressions of cost and value. The specific reservation, or the specific mansion, is going to matter. However, it’s simple enough to say ‘the second gardener’ or whatever to uniquely identify the one you really want to hire. Likewise, ‘activate my old friend’ or ‘activate my third farm’ are all going to be suitably clear for anyone enacting instructions on another player’s part. We’ll recommend, just, Last Will in this category. There’s no formal need for communication although there is a need of sorts for literacy at least in the short term. There’s a symbolic language used but you’ll need to cross-reference it regularly in the manual until it’s (mostly) memorised. We’ll recommend Last Will in this category. This is a game where the expectations of primogeniture are brought heavily into play. However even if the theme was sufficiently strong to validate those expectations it’s not as if every single child born in a family is going to be male. The world of Last Will is a world of men, and women are represented only as the euphemistic ‘guests’ that can be ‘bought’ for use on properties and events. It’s clear from some of the art too what this use is likely to involve. No-one in line for the fortune is a woman, and women are strikingly absent from most of the art-work. The manual doesn’t default to masculinity, but it doesn’t really have to – the game theme does that for it. 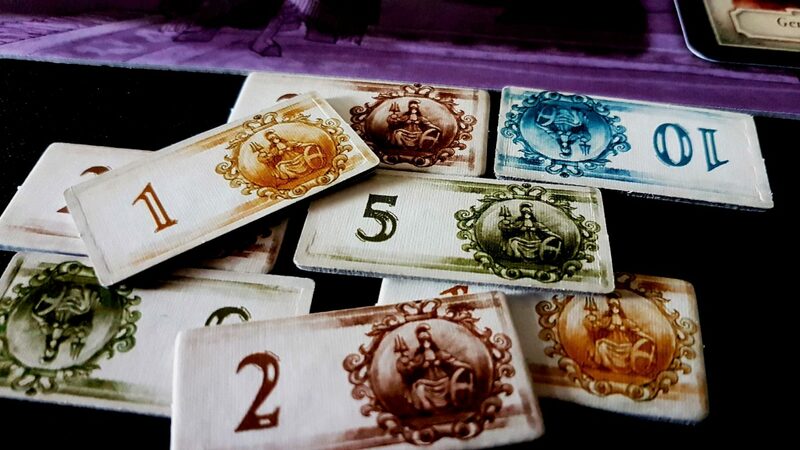 In terms of cost, Last Will has an RRP of around £33 which, in the current climate of games of £50 and £60 and more seems almost impossibly quaint. For the price you get a game that encompasses reasonably elegant scaling from two to five players. What you don’t get though is a game that makes itself particularly approachable. There’s a learning curve that goes with play here, and while you can certainly get people interested in the theme you may find you lose them at the rules explanation. We can only tentatively recommend Last Will in this category. 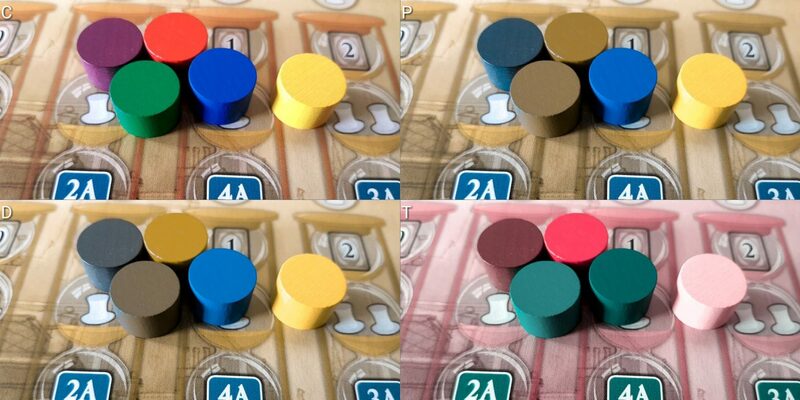 Visual impairment that intersects with colour blindness is going to be an issue – not one that necessarily massively alters the playability of the game but one that adds an additional complication to smooth play. If visual impairment should dovetail with memory impairment we’d be inclined to suggest players look for other games to play. Most of the compensatory strategies for visual impairment are based on holding game state in memory, and most of the memory compensations are based on visual cues on the boards. A visual impairment that intersects with a physical impairment is likely to make verbalising more difficult since often you’re differentiating between game elements based on symbology rather than description. Given the number of cards you might be dealing with, a standard card holder or even two is likely to need your hand to be compressed together rather than splayed out where symbols might be visible. However, communication impairments compounded with physical impairments need not be a major barrier to play – there are sufficiently few game components in use at a time that an exhaustive process of going through all possibilities is feasible. Much of the game state is played open and visible, and this in turn makes things a little easier for intersectional considerations across the board. 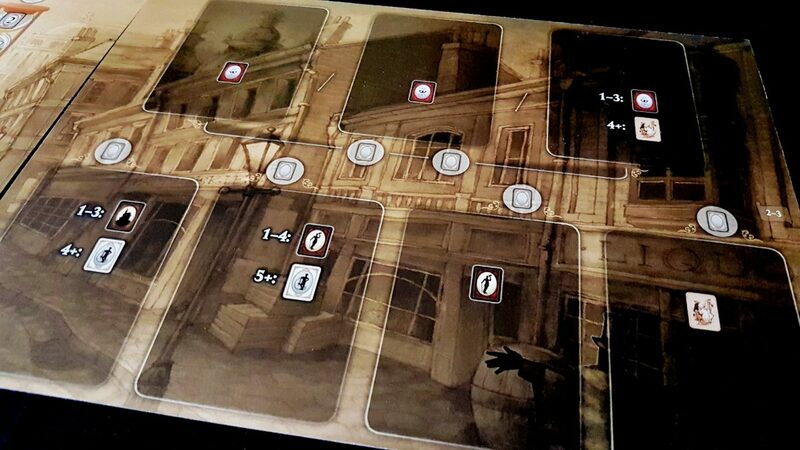 Last Will isn’t a particularly lengthy game – most sessions will last an hour and a half or so. It’s also not a particularly intensive game – there’s a reasonable amount of downtime that can be used to recuperate if needed and the action system means that you can even make tactical selections based on the need to disengage from play for a bit. This is mostly a solitaire game with limited player interaction and you don’t need to be deeply involved in turns that aren’t yours. If it becomes necessary for a player to drop out of play this can be handled relatively gracefully – you can simply keep on playing as if they weren’t there. Last Will has a scaling mechanic that changes the board depending on how many people are playing but there is no real danger that comes from removing board extensions or flipping the board to lower count setups in between rounds. Last Will comes out of this a little less bruised than I expected – it’s a relatively heavy game in terms of its mechanisms and expectations of player numeracy, but otherwise we suspect anyone that likes the sound of it would be able to meaningfully play it. Not necessarily smoothly, and not necessarily without support from the table – but if you fancy being Brewster and getting rid of his millions, this is an option most people can consider. There are some nice features here that I’d like to see being emulated in games more broadly – the activation system as an example is a lovely way of indicating state information and the icons printed onto the card squares of the board mean that you don’t need to remember anything about changing deck compositions or adjusted weights of opportunities. That’s all handled just as a natural part of play. 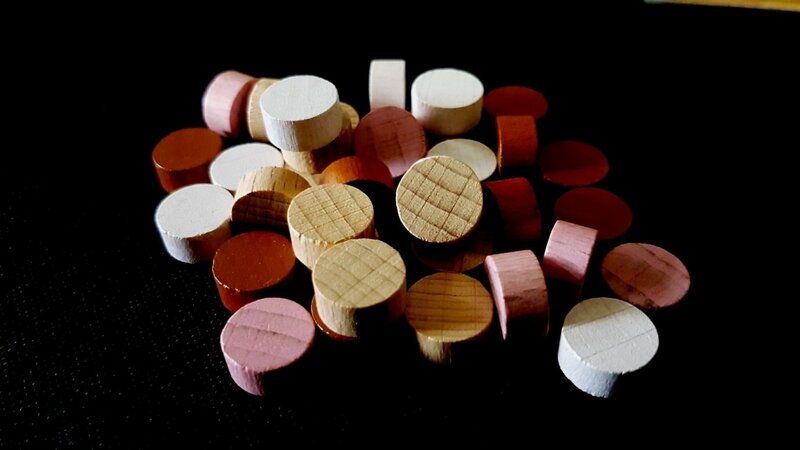 However, Last Will also suffers from a few issues that would have been relatively easily resolved such as its indistinguishable tokens and money chips. It’s a mixed bag, really. At three and a half stars, Last Will is a good game that we enjoyed playing – it’s wickedly funny, although perhaps not as pointedly satirical as we might have liked. While it’s not the most immediately approachable game, if you give it time you’ll find there’s a lot to like in this box. And if it turns out you don’t, you can absolutely turn around and sell it at a loss to someone else. There are few things more thematic than that.